Venus and the moon will shine bright in the southeastern morning sky before sunrise on April 25 and 26 in 2014. This sky map shows the location of Venus and the moon (as well as Neptune) in the morning sky on April 25 as seen from mid-northern latitudes. If your skies are clear before dawn on Friday and Saturday (April 25 and 26), check out the sky low to the east-southeast horizon about 60 to 90 minutes before sunrise for a view of the two brightest objects in the nighttime sky: the moon and the dazzling planet Venus. This "dynamic duo" will make for an eye-catching array in the brightening dawn twilight. Early Friday morning, you will see a lovely crescent moon, about 17 percent illuminated, situated well above and to the right of Venus. They will be widely separated (by about 6 to 7 degrees), but their great brightness will still make them quite attractive. Keep in mind that your clenched fist held at arm's length measures about 10 degrees in width. So the moon and Venus will be separated by just over a half a fist. 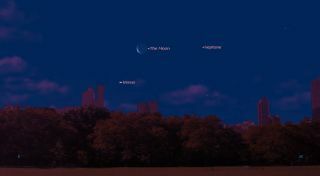 When the moon and Venus come up over the east-southeast horizon again on Saturday morning, the crescent will be thinner (about 10 percent illuminated) and will have shifted to a position about 8 degrees to Venus' left. Still a very attractive sight. These days, Venus has been rising in the east-southeast just a little before dawn's first gleaming. Although it is currently situated some 43 degrees (more than four fists) from the sun, the planet is not very far up at sunrise for northern viewers, because of the shallow angle the ecliptic (the apparent path of the sun, moon and planets in the night sky) makes with the morning horizon. Indeed, at sunrise, Venus is less than 20 degrees above the horizon. The dazzling morning "star" will continue to hug the edge of dawn low in the east until August, then it will slowly sink into the sunrise. As for the moon, it will continue to get progressively thinner as it gets closer to the sun, arriving at new phase on Monday (April 28), when it will appear to eclipse the sun for parts of Antarctica and most of Australia. Editor's note:If you have an amazing picture of the moon, Venus or any other night sky view that you'd like to share for a possible story or image gallery, send photos, comments and your name and location to managing editor Tariq Malik at spacephotos@space.com.